At the beginning of the 21st century the world witnessed the beginning of an unprecedented commodity boom era. [i] Driven in part by China’s astonishing growth, the world demand for raw materials increased staggeringly from 2003 until 2011. 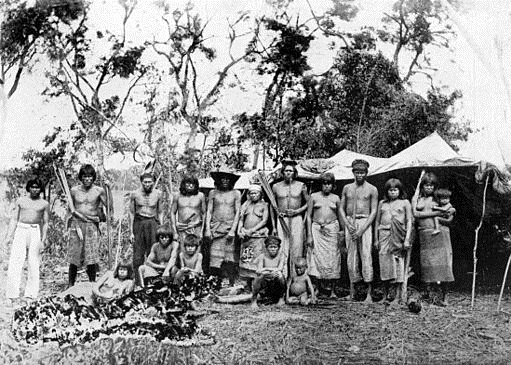 Latin American nations, highly dependent on commodities, benefited greatly as they produced iron ore, coffee, copper, bananas, and petroleum. [ii] This allowed the region to enter a period of stability and prosperous growth as the region’s annual GDP grew 3.98 percent from 2003 to 2011. [iii] This cycle of economic prosperity coincided with the establishment of progressive socialist principles in Venezuela, Ecuador, Bolivia, and Brazil. Suddenly flooded with high export revenues, these governments embarked on a progressive agenda, with an emphasis on social, educational, and infrastructural programs that led to high levels of fiscal spending. The result of such programs is unequivocally stated in a 2016 World Bank (WB) report, “There are now more Latin Americans in the middle class than in poverty, the inequality in income distribution (…) is visibly lower than it was at the beginning of the 2000s, and poverty rates are less than half of what they were and several countries (…) invested (…) in physical infrastructure, education, and firms’ productive capacity.” [iv] Ecuador, under the leadership of Rafael Correa from 2007 to 2017, is an example of a country that reduced poverty and inequality. 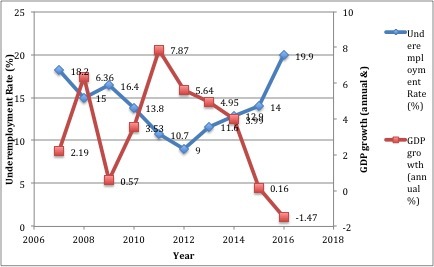 As the economy grew at an average of 3.38 percent from 2007 until 2011 (Chart 1) there were some improvements in key indicators such as unemployment, underemployment, and the size of the informal economy of the market. However, the labor market has now regressed as the commodity boom came to an end. [v] Looking at the data, it is evident that labor conditions have seen little to no improvement, despite the enormous social progress within the country. Informal employment has been a persistent problem throughout the region and the International Labor Organization (ILO) defines it as, ” labour relations that are not subject to the protection obligations established in labour or social regulations, de facto or by law.” [vi] The ILO also reported that as recently as 2013 around 46.8 percent of jobs in Latin America were informal. [vii] [viii] Although it is significantly lower than the corresponding rate of 50.1 percent from 2009, this figure stands in stark contrast to EU nations, for which informality rates range between 10 and 30 percent. 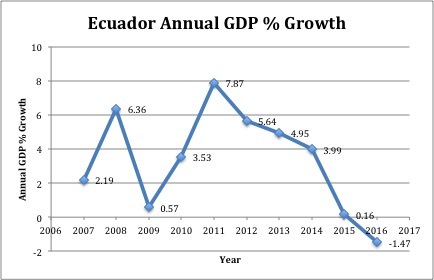 [ix] Ecuador is a prime example of this failure to reduce informality, with the share of its total employment considered informal barely decreasing from 45.1 percent in 2007 to 45.0 as of June 2017. [x] Informality labor markets can arise from many factors, including high entry costs, strict labor regulations, complicated procedures, corruption, weak rule of law, and lack of accountability. [xi] However, it is the costs of informal labor markets, rather than the causes, that are truly troubling. Firstly, because informal workers do not make social security contributions, they are not entitled to seek enforcement of government labor standards, including sanitary working conditions, severance payments, and minimum wage. Secondly, informal workers tend to be loosely associated and lack the collective bargaining power that formal laborers gain through unionization. [xii] As a result of these two factors, informal employees receive significantly lower wages than their formally-employed counterparts. 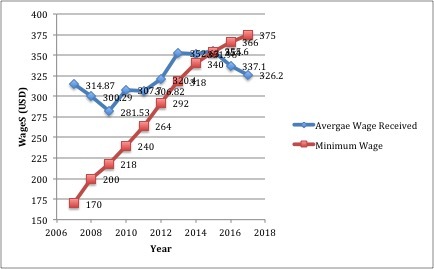 While monthly minimum wage in Ecuador increased from $170 in 2007 to $375 in 2017, the average wage received by an individual worker only went up from $314.9 to $326.2 over the same time period. 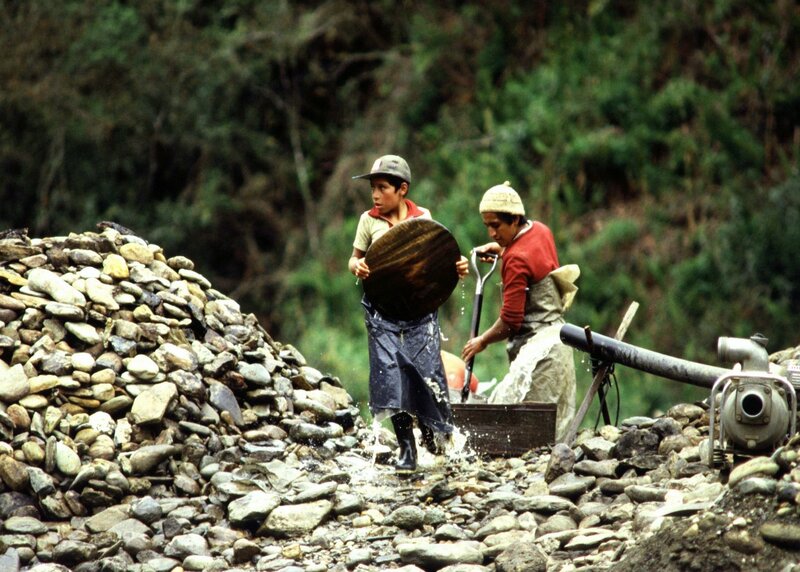 The large disparity between the 134% increase in minimum wage and 3.5% increase in average wage is due in large part to the prevalence of informal labor in Ecuador. [xiii] In fact, informal labor constitutes such a large portion of all employment that the average wage is less than the minimum wage which the government guarantees to formal laborers. (Chart 2) Furthermore, when facing high levels of informality, countries struggle to collect taxes and that in turn means a lower investment in social programs, infrastructure, etc. In addition to high informal labor participation, the stagnation of actual wage growth could be explained by underemployment. Underemployment is when someone who would otherwise want to work full-time is unable to make a living due to inability to acquire working hours and to earn a minimum wage. [xiv] As of June 2017, the properly employed workers in Ecuador earn $526.09 USD on average while the underemployed average wage is $143.80 USD. [xv] The percentage of workers categorized as underemployed has gone up from 18.2 in December 2007 to 20.5 this past June, although it did hit a low of 9.0 percent in December 2012 during the commodity boom. Following this record low in underemployment, the economy started to decelerate and the figure reached a high of 21.4 percent in March of this year. [xvi] Chart 3 shows the inverse relationship of annual GDP growth and underemployment, meaning that whenever one goes up, the other will consequently go down. Furthermore, Ecuador’s unemployment rate, the most widely used indicator of labor market conditions, has seen bleak improvement between December 2007 and June 2017. It did decline from 5.0 to 4.5 percent in this period, a success, which becomes less encouraging when you take into account the amount of informal and underemployed workers. [xvii] Both informal employment and underemployment, along with non-paid or otherwise unsuitable employment are included in a the “undesirable employment” category which constitutes 59.89 percent of the jobs in the economy. The 2017 figure is worse than the 2007 figure that only accounted for 56.80 percent of undesirable employment within the total number of jobs. [xviii] The fact that this figure is higher than ten years ago raises questions about how the labor market was structured to secure a long-term improvement in workers’ conditions. Although more people are working, the fact that they are doing so in less desirable circumstances undermines the credibility of improvement in unemployment figures. 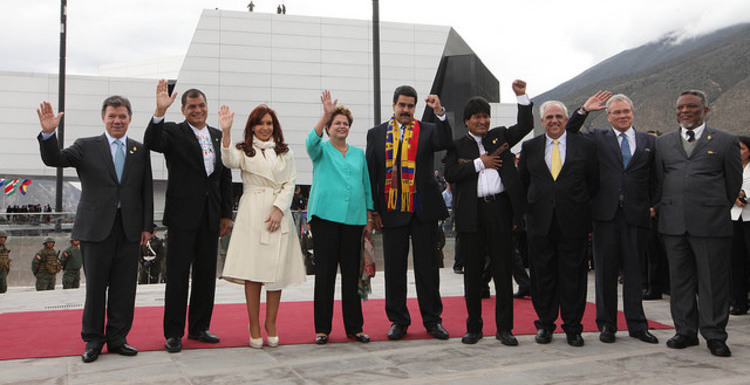 On top of this entire situation, Ecuador also faced the challenge of being a dollarized economy. Dollarization deprives the Ecuadorian government of an independent monetary policy, a key adjustment mechanism for when it faces economic downturn. When you combine this with the problematic factor of Ecuador’s restrictive labor regulations, the unemployment (or underemployment) adjustment is much more significant. Whenever there is an economic contraction, there is bound to be deterioration in the labor market. Nonetheless, it is troubling that this recent recession was all it took to undo all the improvements of the last decade. Some might say that comparing Ecuador to EU countries is unfair, but it is those standards that the government should aim for. Ecuador has fallen once again into this vicious cycle of informality and low wages, and it remains to be seen how the nation will tackle this issue once again as it faces a tough road ahead. [i] World Bank. “Commodities at the Crossroads 2009.” Global Economic Prospects, November 20, 2008. Accessed September 14, 2017. http://siteresources.worldbank.org/INTGEP2009/Resources/10363_WebPDF-w47.pdf. [iii] World Bank. GDP Growth (annual %) | Data. Report. 2017. Accessed September 20, 2017. https://data.worldbank.org/indicator/NY.GDP.MKTP.KD.ZG?end=2016&locations=ZJ&start=1960&view=chart. [vi] ILO. “Recent Experiences of Formalization in Latin America and the Caribbean.” FORLAC, 2014. Accessed September 15, 2017. http://www.ilo.org/wcmsp5/groups/public/—americas/—ro-lima/documents/publication/wcms_245882.pdf. [viii] Gonzalez, Elizabeth. “Weekly Chart: Latin America’s Informal Economy.” AS/COA. April 02, 2015. Accessed September 17, 2017. http://www.as-coa.org/articles/weekly-chart-latin-americas-informal-economy. [ix] Hazans, Mihails. “Http://ftp.iza.org/dp5871.pdf.” Discussion Paper Series, July 2011. Accessed September 15, 2017. http://ftp.iza.org/dp5871.pdf. [x] Instituto Nacional De Estadística Y Censos. “Empleo – Junio 2017.” Instituto Nacional De Estadística Y Censos. June 2017. Accessed September 14, 2017. http://www.ecuadorencifras.gob.ec/empleo-junio-2017/. [xi] Oviedo, Ana-Maria. “Economic Informality and Growth.” Country Economic Memorandum (CEM) – Informality: Causes, Consequences, Policies, June 2009. [xii] Global Fairness Initiative. “Informality in Emerging Markets: A Cross-Country Examination 2012.” 2012. Accessed September 08, 2017. http://www.globalfairness.org/downloads/2012%20Informality%20FINAL.pdf. [xiii] Astudillo, Giovany. “El Salario Mínimo En Ecuador Pasó De USD 160 a 366 En 10 Años.” El Comercio. December 14, 2016. Accessed September 16, 2017. http://www.elcomercio.com/actualidad/salariobasicounificado-salariominimo-ecuador-inflacion.html. [xiv] Redaccion, El Universo. “Subempleo Aumentó En Un Año En Ecuador.” El Universo. July 18, 2017. Accessed September 16, 2017. http://www.eluniverso.com/noticias/2017/07/18/nota/6286678/subempleo-aumento-ano. [xv] Instituto Nacional De Estadística Y Censos. “Empleo – Junio 2017.” Instituto Nacional De Estadística Y Censos. June 2017. Accessed September 14, 2017. http://www.ecuadorencifras.gob.ec/empleo-junio-2017/. [xix] ILO. “2016 Labour Overview of Latin America and the Caribbean.” February 24, 2017. Accessed September 15, 2017. http://www.ilo.org/wcmsp5/groups/public/—americas/—ro-lima/documents/publication/wcms_538067.pdf.